Holidays crashed over me and the New Year started pretty rough. A mix up at the pharmacy has left me with a bit of a brain chemistry issue I’m still dealing with. (For the record; double check labels and spelling on any medications you take.) It’s been a fun month or two. But despite the weird mood swings, head aches and drowsiness I have actually gotten something done. It might be somewhat obvious on here but I’m a bit of a history nerd. 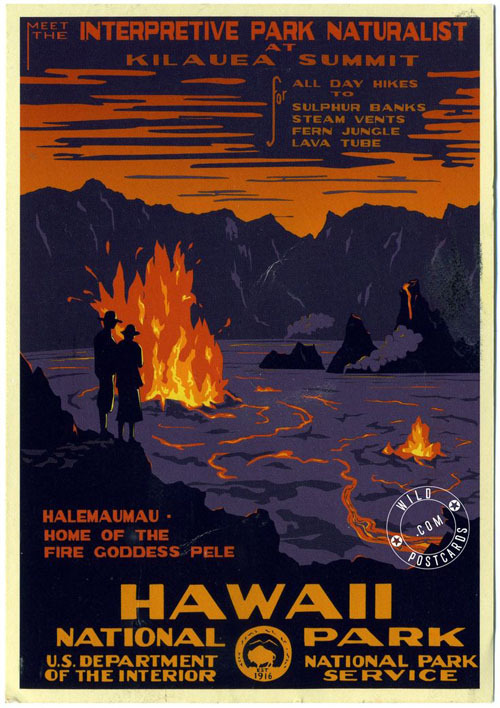 I also love and collect vintage posters and post cards (well reprints anyway.) 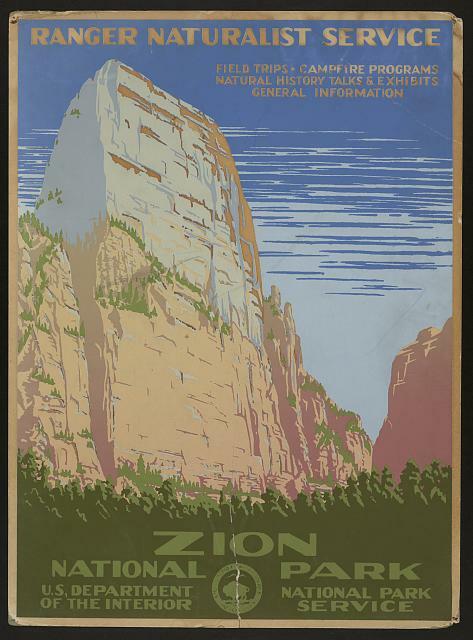 A few years back during a cross country road trip I got introduced to the National Park posters from the Depression era Works Project Administration and fell in love with them. The Works Project Administration was a program that was part of the New Deal to stimulate the economy and get unemployed folks working. In an attempt to get out of work artists producing and as a way to get art to the lower classes they started commissioning posters for various events and projects. Public Service posters, Health Reminders, local events, and in this case advertising the National Parks. 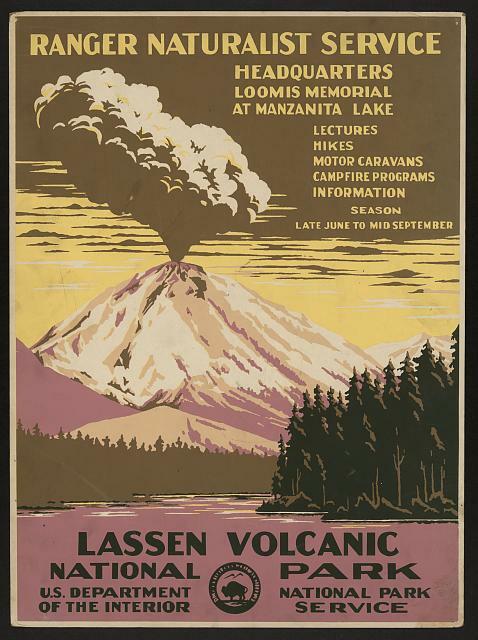 For more information and examples the Library of Congress has more information and over 900 examples of said posters. Me being a graphic design nerd and a bit of a gamer, I tried this style out for a location in Fallout New Vegas – because making travel posters for imaginary, inhospitable locales amuses me. I had a lot of fun making that poster and it surprisingly was a great eye catcher at my last convention so I decided to try to give it a revisit when I had the chance. As per usual I can never post anything on time. I had started writing this in January and then I guess forgot about it. I’ve been dealing with some hilarious brain chemistry issues so I’m going to go point to that and blame that. I sure had a thing for blue last year. So 2016 is here, a couple of my idols died, and we still don’t have any of the space age implements promised to us. Seems like a grand start. As per usual I started the new year so fried and burned out from the holidays and holiday prep that it takes me a while to get my brain in gear and start getting my act together. New Year may be on the first of the month but my new year proper doesn’t set in until at least the 7th. I always like to do these silly sort of memes of art of the year around this time. It allows me a nice chance to look through my old files and choose a piece for each month that I’m proud of. This year it serves as a nice gauge to measure when I played what videogame or saw which movie. From my understanding a lot of folks see this time of year as a sign to start dieting, start exercising, promise to read piles of books, drink more water, floss their teeth. For me it usually means its time for me to start sorting my taxes, go over last year’s paperwork and figure out my attack plan art wise for this year. I’ve been dealing with depression for the past couple years and have learned not to make grand plans. One never knows what is going to happen in a year or what curve balls will happen.